If you spent any part of this day waiting in line to buy the latest Apple product - like the iPad 4 pictured above* - this post may not be for you. This post is for those of you who crammed their scratched up communications devices into their packs to head out and enjoy the world before the icy hand of autumn death finally arrives. It's not that I've soured on autumn, it's just that this was a beautiful and memorable summer: a trip to Cleveland to give a bike away, my first trip to Barcelona, my first ride with a Stamford mayoral candidate, a California adventure and, of course, Bluff Point State Park. I don't know how I'm going to make this next season top that. But anyway, we have 48 hours until we turn to pumpkins.48 hours until your lemonade changes to cider, your beach umbrella changes to a plastic rake and your thin, comfortable jersey turns into an ill-fitting, I-can't-tell-whether-I'm-hot-or-cold cycling jacket. Now you can't do the equivalent of pouring boiling water into a cold glass. 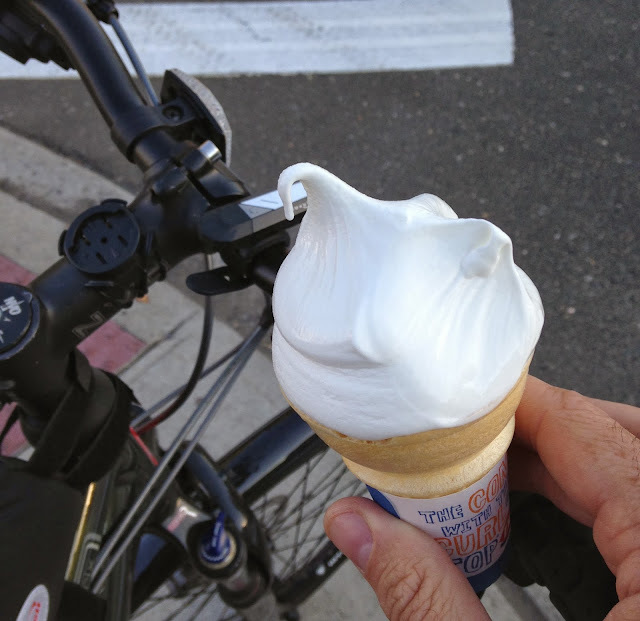 Ease into the fall and follow the rules of summer along the way, like Rule #22: local ice cream shops. 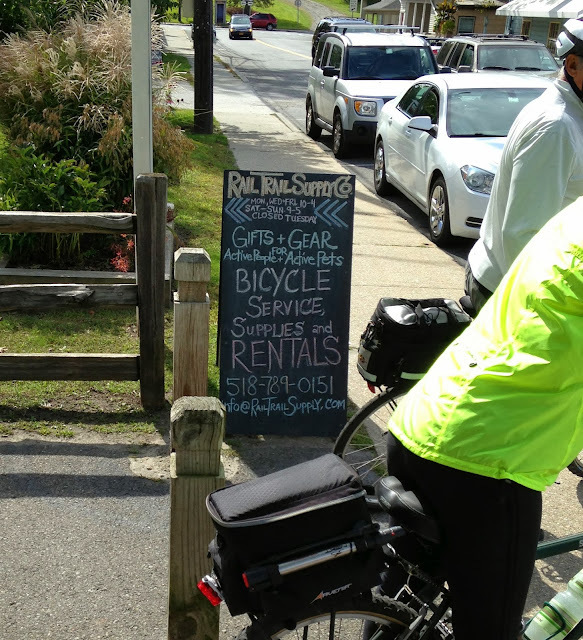 Since we are days away from a lot of places putting the dreaded 'closed for the season' signs on their outside of shuttered doors, be certain to take advantage of the places that have the outside lines (so you don't have to leave your bike when ordering the treat). 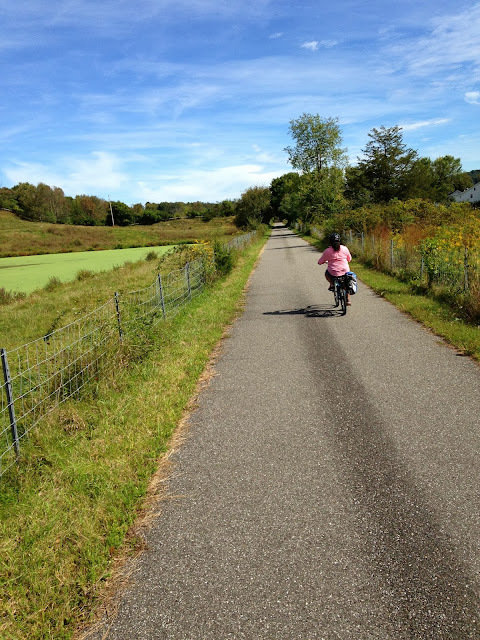 Also: take a relaxing ride like the one my wife and I took this past Sunday: If you're in reasonable driving distance, I suggest the Harlem Valley Rail Trail. The way I do the trail is driving the car up to the Wassaic, New York Metro North station, parking in the lot, and riding the trail the 10+ miles to Millerton. It's paved all the way and mostly smooth, so if you bring a skinny-tired bike you shouldn't have any problems. I always bring the recumbent since it fits in with the relaxed setting. Now according to the bike GPS, one climbs about 200 feet over the course of the ten miles. Very gradual. After all, this used to be a rail bed, and unlike some other rail trails, there are things to see along the way, not that many road crossings and very little traffic noise. The trees are changing and the tires will crunch on the dead organic matter (I'm sorry: pretty autumn leaves) covering parts of the trail. As you come into Millerton, you can lock your bikes up to the rack found on your right - the one that is across from the Rail Trail Supply Company, where you can rent a bike, get one serviced or pick up supplies. 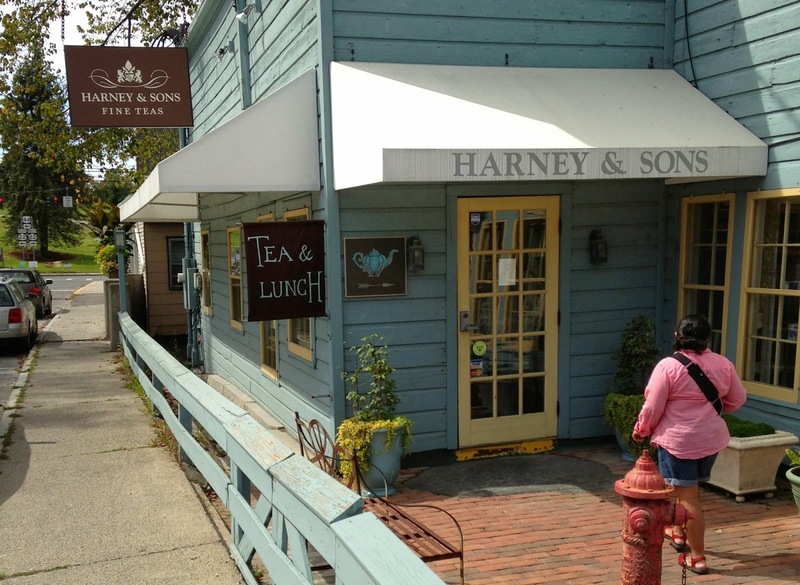 Just across the street you'll find Harney & Sons. If you like tea and you haven't been there…you're going to want to go. 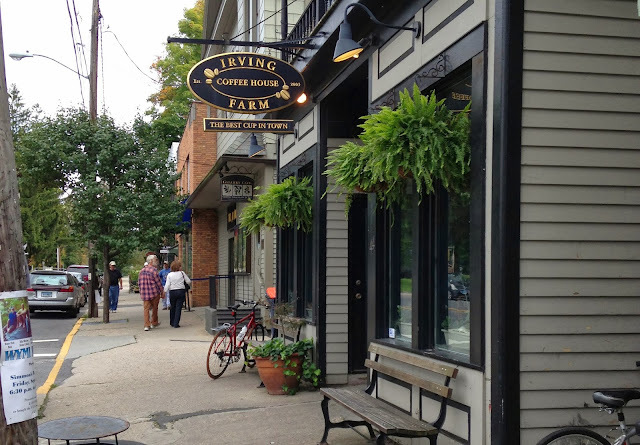 They have tea and serve lunch, so it's a good idea to ride in the morning to Millerton to eat. I'm not a tea person, but my wife is, so while she was sampling tea I was buying a pound of coffee beans from Irving Farm Coffee Roasters. 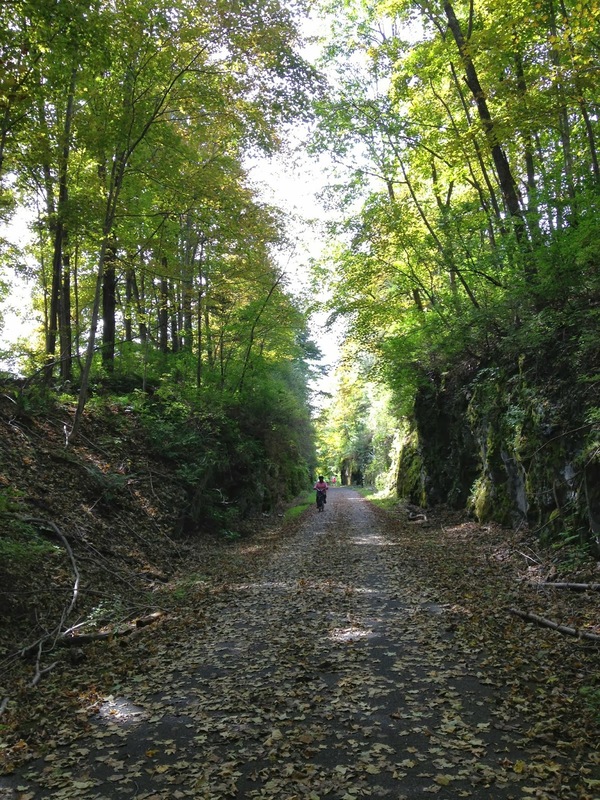 Now a nice part of this rail trail is that the town of Millerton has a great bookshop - the outstanding Oblong Books & Music - and other interesting places to wander. So if you go with someone who doesn't ride as much as you - and browses more - you can ride back to get the car and drive back to Millerton before finishing the day. So that's what we did. Going back alone, I still enjoyed the trail and went much faster even though I still slowed down to say 'on your left' before riding by the other people who were out enjoying the trail. Other than a stop to try to photograph a hawk, this was the only picture I took on the way back: it's my watch and my GPS: only 38 minutes to go the 10.7 miles from Millerton to my car. I think the socks I was wearing made me feel like I could go fast. And that was a good ride to help ease myself into autumn - which is already dumping a huge number of dead organ…pretty yellow leaves everywhere. Look what I saw on my way up Rt. 106 to New Canaan this morning. I'll be sure to get more rides in between now and Sunday, and will try to make this a great autumn. I may even hire a guy to rake my leaves this year and go for a bike ride instead, but I'm getting ahead of myself. 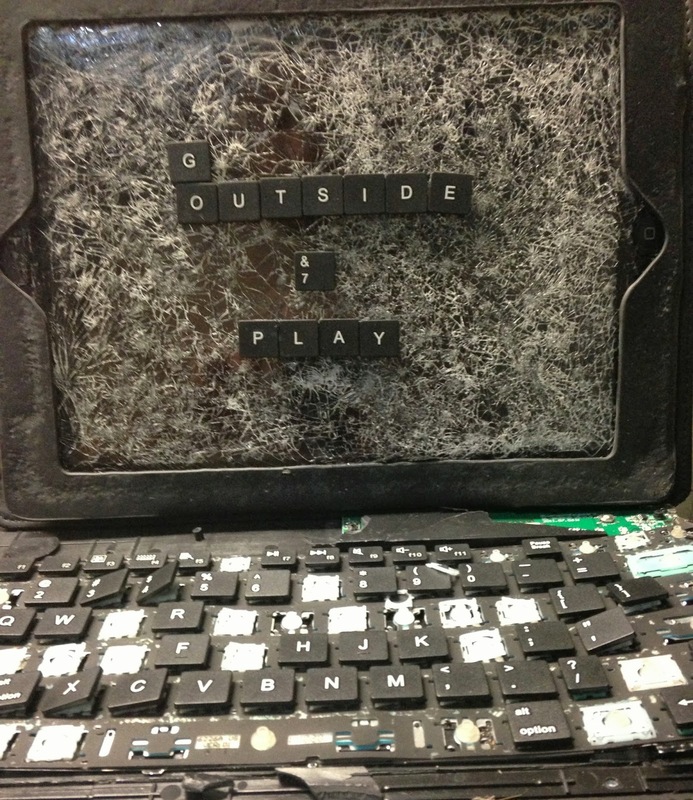 I'm going to put this post up and go outside and play. Hope you do too. Thanks for reading and thanks for riding. *made you look - it's really an iPad 2 I found on - where else - a bike ride earlier this year on High Ridge Road in Stamford. Too smashed up to try to find the owner, I peeled off some letters from the keyboard and went nuts with the crazy glue. The ipad picture is perfect. Might you add your name to it and make it available to share?